This winter has certainly made me glad to be living in Florida. Not to o much really cold weather causing damage in the landscape. We did have one heavy frost in January that hit those zone 10 plants that we love to plant in our zone 9 gardens. They may have brown drooping leaves now, but they are most likely still alive. Wait until you begin to see new green sprouts emerging from the stalks and then prune back to this point. Damaged herbaceous plants like bananas, begonias, gingers and haliconias can be pruned back to the ground if needed. They should sprout from the roots once the weather warms. f you have roses, now is the time to do some pruning to shape them. You can remove about a third to one half the height of the plant. Remove dead or thin spindly canes back to a more robust cane. 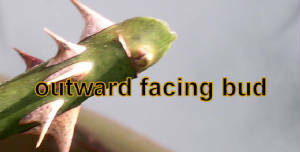 Prune canes back to outward facing buds so that the plant will have a more open shape that allows for good air circulation. If your roses are prone to black spot and powdery mildew diseases, the American Rose Society recommends removing all of the foliage from the plant as well. Rake up all of the fallen leaves, provide fertilizer and a fresh layer of mulch. Shrub roses like the Knockout® series do not need such drastic pruning since most of them are disease resistant. directions on the label carefully. For more information, access the Univ. of FL/IFAS publication Growing Roses in Florida at: http://edis.ifas.ufl.edu/ep339.